Great all-rounder of a lodge: intimate and secluded for people wanting a romantic break; loads of activities to keep families and adrenaline-junkies happy too! The Villas with their private pools and decks are a superb choice for families or groups of friends! Enjoying the view from the deck over the channel and Inhaca island as you nurse a bitterly cold Dois M! whilst Machangulo is the perfect place to come and chill, the wide variety of activities available at the lodge will no doubt have you emerging from the comfort of your room sooner rather than later! Paradise isn’t a long journey away. 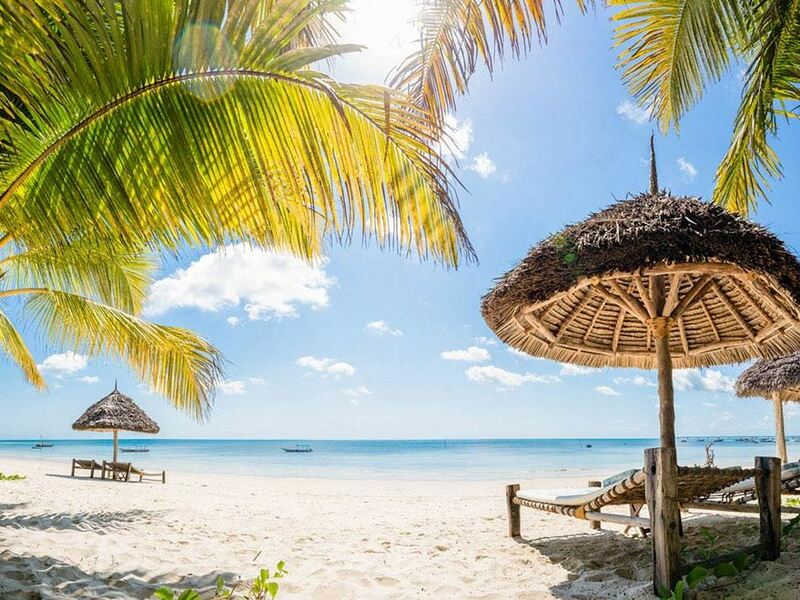 A short 1 hour flight from Jo’burg to Maputo followed by a quick transfer to Maputo’s marina and you’re picked up by a very smart speedboat ready to be swished across the vast expanse of the bay to Machangulo Beach Lodge. The crossing takes about an hour depending on water conditions and in the process you’re transported a world away from the hustle and bustle of the city to a location of pristine natural beauty. Winding your way between the myriad sandbanks (keep an eye out for flocks of spectacular pink flamingos, especially in the winter months) you’ll find yourself dropped off on a stunning white sand beach that lines the narrow channel running between Inhaca island on one side and the imposing sand dunes of the Santa Maria peninsular of the other. 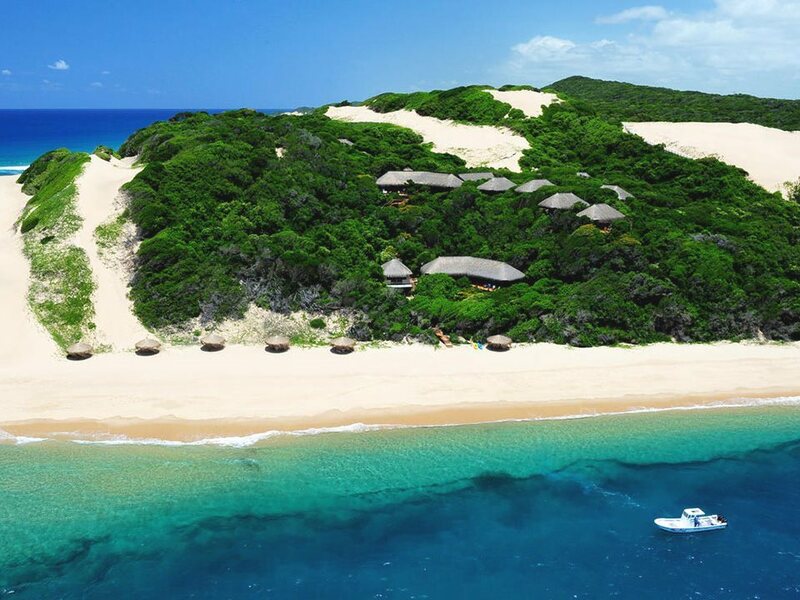 The warm greeting on the beach from the lodge staff and the scattering of thatched beach umbrellas lining the sand are the most obvious signs of the lodge’s presence, as it’s tucked away wonderfully unobtrusively in the thick forest that covers the dune. 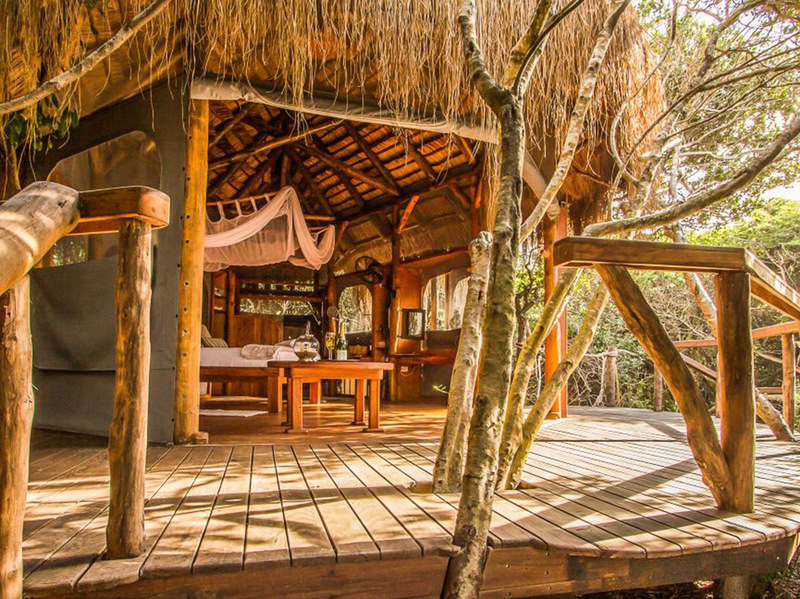 Here and there you’ll spot a thatched roof poking its head out or perhaps a wooden deck, but otherwise Machangulo is a perfect example of a lodge truly blending sympathetically into its surroundings. Along the wooden pathway past the swimming pool and up the stairs and you’ll come to the main lodge building with its expansive view deck – you’ll no doubt spend more than a few hours out here during your stay, soaking up the spectacular views over the channel towards Inhaca island and with the vast expanse of the Indian Ocean alongside (more likely than not with an ice cold Dois M beer close at hand and a plate of delicious grilled prawns in front of you!) 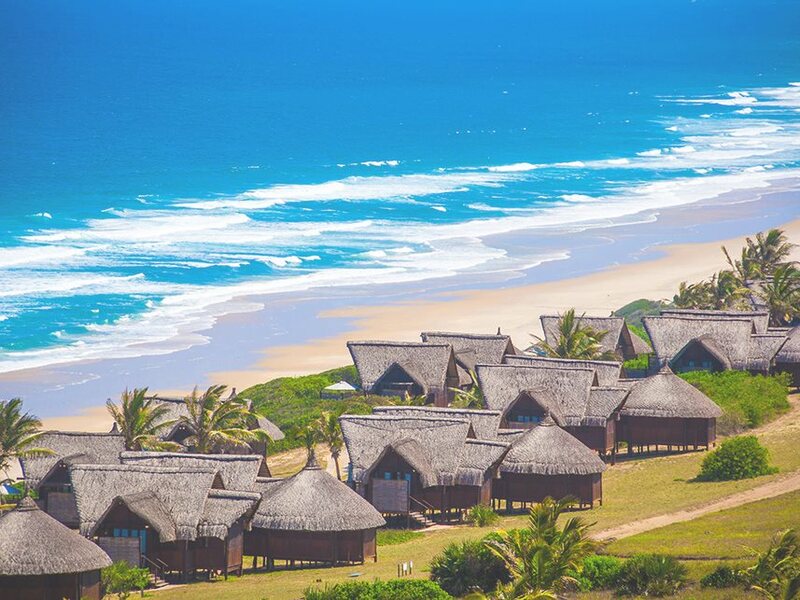 It’s at the top of the dune that you’ll also find the lodge’s 5 Ocean View rooms (we’ll come to the villas later) each boasting their own wooden view decks and cleverly positioned in such a way that each of them enjoy great privacy. For families and groups of friends holidaying together though, it’s Machangulo’s 4 Villas that offer the perfect accommodation choice. The Villas have been built lower down and around the corner from the main lodge – literally a few metres from the beach lie the 2 Beach Villas (each with 4 en-suite rooms) whilst a little further back in the forest you’ll find the 2 Family Villas (perfect for smaller families with their 2 en-suite rooms each) A huge plus point here is that each of the villas also have their own private swimming pools and wooden decks, so you really can relax and enjoy each other’s company undisturbed. But whilst Machangulo is the perfect place to come and chill, the wide variety of activities available at the lodge will no doubt have you emerging from the comfort of your room sooner rather than later! Perhaps the most popular activity of all is going snorkelling on the wonderfully protected coral reefs of the Inhaca Marine Reserve, reached via a quick 1 minute boat ride across the channel – amongst all the colourful coral and reef fish you might be lucky enough to spot a turtle gliding around (or even a giant kingfish lurking in the deeper waters beyond!) After enjoying your snorkel, you will then enjoy a lovely picnic on the beach of the Marine Reserve! At neap tides you can even enjoy good snorkelling right in front of the lodge. Talking of kingfish, Machangulo is a stunning destination for keen anglers who will enjoy seriously world-class fishing, both going out deep-sea by boat as well as shore-based angling on the beaches around the lodge (including excellent fly-fishing opportunities in the channel right in front of the lodge) Even better news is that the prices of going out deep sea are a lot more reasonable than many of the other upmarket lodges in Mozambique. Jigging, drop shot, plugs or fly – whatever technique you fancy, Machangulo more than delivers! Then there’s also the chance to visit the local villages, walk the endless stretch of wave-pounded beach on the open-sea side of the dune, head off on a sunset dhow cruise around the bay, picnic on the pristine sandbars that emerge like jewels out of the sea at low-tide, scuba dive on some of the nearby reefs (or perhaps do a PADI dive course whilst on holiday), keep a look out for the passing humpback whales during the winter months, go kayaking on the estuary or in the mangroves, or simply enjoy a pampering massage on your private deck – do as little or as much as you like at Machangulo!